What makes you different as a lawyer? Lawyers who have successfully "branded" themselves as personalities are few and far between. 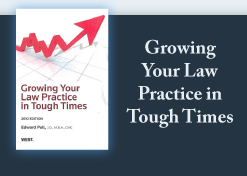 Most clients presume each lawyer is as competent as the next, and most lawyers are comfortable conforming to the general image of their peers. Of course, there are marketing tactics to be memorable and differentiated from other lawyers - in any major city the lawyers who advertise their services on television are proof of that. But this ultimately is unimportant. So far as the concern of the client - and legal ethics - the quality of legal service and not the degree of salesmanship and promotion is what's important. There is, however, another way that lawyers can differentiate themselves, one that is internally focused on the degree of success they realize from their practice. Too many lawyers feel like a PRE-owned car - old and burned out. These lawyers need to change the PRE into the formula for success that we have discussed many times: P = R - E ...profits equal revenues minus expenses. They should do so by focusing on becoming more effective with their clients, thus increasing their revenue; and becoming more efficient in the delivery of their legal services, thus decreasing their expenses. The net result is to increase their take-home earnings, or their profit. Firms grow based on their clients, so look for clients who have growth potential. In other words, "commodity" work will not result in high and profitable growth. Highly focused and "high-end" work will result in higher revenue and profits. The most profitable services are the ones clients value, so move beyond the billable hour and into billing by the value of your services, where the profits are significantly higher. Clients will accept higher fees, provided your services, skill and experience justify a fee increase. Look at other current market conditions and competitive pressures in your geographic and practice areas. If you believe your strengths and your market justify an increase, choose a time that places the client at the peak of the "satisfaction curve" after you've won a motion or negotiated a favorable deal—even if somewhat before or beyond your normal billing date. Those clients who believe your service to be of value will accept the higher fees and remain with you. Lawyers who stand out may or may not have better skills or get better results than their peers. However, they do things differently by setting themselves up for greater profitability and, ultimately, for greater success. Recently, a psychology study reported that we do not do multi-tasking. The brain can focus only on one task at a time. We may do a series of things quickly, but not all at the same time, though it may seem that way. The same is true with vision. We use one eye at a time, according to an ophthalmologist, but we switch our eye focus so quickly that we believe we're looking at one object at a time. These lessons came home to roost, big time, this week. We're changing our computer system. In the meantime, I'm running my coaching and consulting business. My experience has been that when our tech support works on the computer system, I'm actually OUT of business, causing great frustration on my part. Does this resonate with any of you? Oh yes, at the same time, we created a new shopping cart for our web site. It was supposed to go "live" on January 1st. But between technical problems and the tardiness of the merchant account provider, we have been delayed, again creating frustration. We will be converted by the end of this week! And we will be live by the end of this week! Life is good. As Costa Ricans say (click here see my blog post on my trip), Pura Vida! This is not a crisis, but sure as heck feels like one.